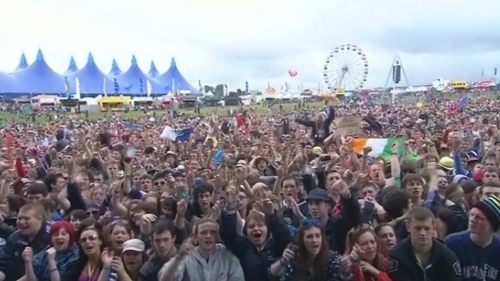 Persistent downpours failed to dampen the mood at the Oxegen music festival as around 75,000 people descended on the Co Kildare venue. However, for those fans who do not fancy spending a damp night at the venue, organisers say that those with a three-day festival pass can go home tonight and freshen up and still get entry on their original wrist band tomorrow. Fans can either use Dublin Bus to return to the city centre or avail of the extra shuttle buses to the park-and-ride facilities at Goffs and Naas where they can be collected. Gardaí have advised that there will be no access to the festival site for private cars or taxis to pick up people. Meanwhile, gardaí have reported very little trouble at the festival in Punchestown. Seargent Damien Hogan has said that they have had only minor offences to deal with. Over 200 gardaí will be on duty in Punchestown over the next two days. Met Éireann has said there is a risk of heavy and possibly thundery downpours in places and possibly localised flooding tonight. However, tomorrow should see an improvement with sunny spells forecast and temperatures of between 16 to 20C.